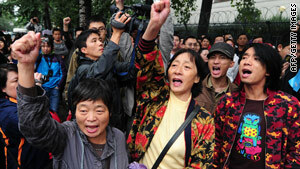 A crowd protests against the fishing boat captain's detention outside the Japanese embassy in Beijing on Saturday. Tokyo, Japan (CNN) -- A Japanese court has extended the detention of a Chinese fishing boat captain, as diplomatic tensions between the two countries rise. The Ishigaki Summary Court in Okinawa decided that the captain will be held at least until September 29, the Japanese Coast Guard told CNN on Monday. The ruling comes after China warned Sunday that it would take "strong counter measures" against Japan, if the captain was not released. China has already suspended high-level bilateral exchanges with Japan over the issue. 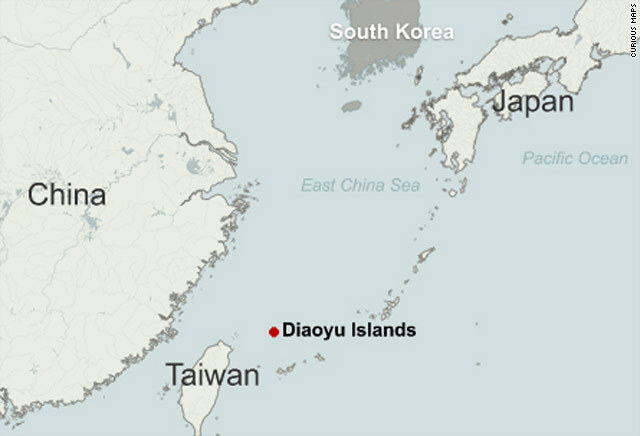 The captain was arrested earlier this month off the disputed Diaoyu Islands, in the East China Sea, after his vessel crashed into two Japanese patrol boats. He is accused of obstructing Japanese public officers while they performed duties. In a late-night phone conversation with the Japanese ambassador in Beijing Sunday, Chinese Vice Foreign Minister Wang Guangya said the captain's detention had "severely damaged China-Japan relations," the Chinese state-run Xinhua news agency reported. The country has also stopped talks with Japan about increasing civil flights and expanding aviation rights between the two countries, Chinese foreign ministry spokesman Ma Zhaoxu said. A bilateral meeting on coal was also postponed, Ma said. "China will take strong counter measures if the Japanese side clings obstinately to its own course and double its mistakes, and Japan shall bear all the consequences," Ma said in a press statement. Japan has urged China to proceed calmly and cautiously to avoid further deterioration of the situation, the Japanese Embassy in Beijing said. Japan has already freed the captain's 14 crew members, who have flown back to China, and returned the fishing boat as well. The incident has raised tensions between the two countries and their citizens. In Beijing, Shanghai and Shenyang on Saturday, anti-Japanese protests were held. The Japanese Embassy in China has warned Japanese citizens in China to be on guard. "China has reiterated time and again that Japan's so-called legal procedures against the captain were illegal and invalid," Ma said. "We demand the Japanese side immediately and unconditionally release the captain. Or the Japanese side must shoulder all consequences that arise." CNN's Junko Ogura and Jo Kent contributed to this report.